The refining process of edible vegetable oils can be divided into general edible oil refining, advanced edible oil refining and special oil refining. 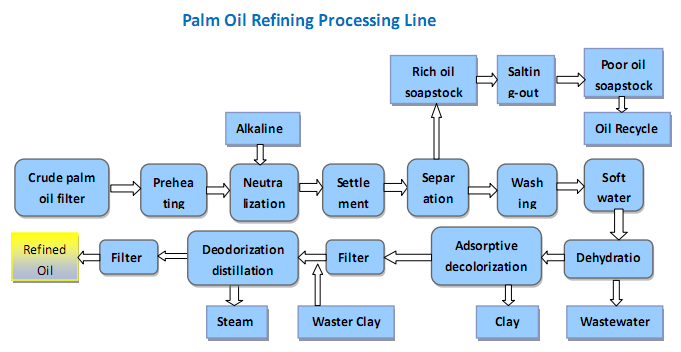 Here we’ll see the refining processing of the typical edible oils. Rapeseed oil is a semi-dry oil containing erucic acid. Except for canola oil, the other varieties of rapeseed oil contain more erucic acid, which accounts for 26.3% to 57% of the fatty acid composition. High erucic acid oil is less nutritious than low-erucic acid oil, but is particularly suitable for industrial oils such as marine lubricants and tires. In the process of oil production, the mustard seed is hydrolyzed by the enzyme of mustard, forming some sulfur-containing compounds and other toxic components.This affects the quality of the oil. The general smelting process has a very low removal rate of sulfides. Therefore, edible rapeseed oil should be refined. Alkali refining operating temperature initial temperature 30~35 °C, final temperature 60 ~ 65 °C. Lye concentration 16°Bé, the amount of excess alkali added is 0.2%~0.25% of the oil amount. Add saponin, 0.5% of the oil amount, (concentration is 40°Bé). The neutralization time is about l h, and the sedimentation separation time is not less than 6 h. Alkali refining washing temperature 85～90°C. The first washing water was dilute saline water (alkali concentration 0.4%), added 0.4% oil containing salt and the added amount was 15% of the oil amount. After washing several times with hot water, till the amount of soap in the alkali refining oil is not more than 50 ppm. Decolorization, first vacuum dehydration for 30 min, under temperature 90 °C, operating absolute pressure 4.0 kPa. Then add the activated white clay to decolorize, for 20 min, the amount of white clay added is 2.5% ~ 3% of the oil amount. Decolorization temperature is 90～95 °C, then cool down to below 70 °C to filter. The decolorized filter oil is heated to 100 °C by a vacuum suction deodorization tank formed by a primary and secondary steam jet pump, then turn on the third and fourth stage steam jet pump and the atmospheric condenser cooling water. The deodorization temperature is not lower than 245 °C, and the absolute pressure is 260-650 Pa. The atmospheric condenser water temperature is controlled at about 30 °C, and the stripping direct steam pressure is 0.2 MPa, the amount of the feed is 8 to 16 kg/t·h. The deodorization time is 3 to 6 hours. After the deodorization is completed, it is cooled to 70 °C and filtered. The filter oil contains no more than 0.2%. The alkali concentration is 18~22°Bé, and the excess alkali is 10%~25% of the theoretical amount of alkali. Sometimes add 0.05% ~ 0.20% of phosphoric acid (concentration is 85%). The degumming temperature is 70 ~ 82 °C, the washing temperature is about 95 °C, and the soft water addition amount is 10% to 20% of the oil amount. Continuous vacuum drying and dehydration, temperature 90 ~ 95 °C, operating absolute pressure is 2.5 ~ 4.0 kPa. The adsorption decolorization temperature is 105 ~ 100 °C, the operating absolute pressure is 2.5 ~ 4.0 kPa. The operation time at the decolorization temperature is about 30 min, and the amount of activated clay added is 1% ~ 4% of the amount of oil. The filtration temperature when separating clay with a vertical vane filter is not lower than 100 °C. In the decolorized oil, P ≤ 5 ppm, Fe ≤ 0.1 ppm, and Cu ≤ 0.01 ppm. The deodorization temperature is about 240 to 260 ° C, the absolute pressure is 260 to 650 Pa, and the steam is introduced into the oil by 0.5% to 2%. The deodorization time is 40 ~ 120 minutes, and the amount of citric acid (concentration 5%) is 0.02% ~ 0.04% of the oil amount, and the safe filtration temperature is not higher than 70 °C. Palm oil is obtained from palm fruit pulp. Its fatty acid composition accounts for 40% to 50% of saturated acid, 80% of which is palmitic acid, oleic acid is the main unsaturated acid, followed by linoleic acid. Because palm fruit is decomposed by lipolytic enzymes before harvesting and oil production, combined with processing methods and storage and transportation conditions, the free fatty acid content of palm oil is comparatively high. It is generally about 10%, and high level is more than 30%. The impurity filtration temperature is not lower than 50 ° C, and the oil content after filtration is not more than 0.2%. Interval break neutralization initial temperature 30 ~ 35 °C, final temperature 60 ~ 65 °C, lye concentration 16 ~ 18 °Bé, excess alkali accounted for 0.2% ~ 0.3% of oil, neutralization time l h or so. The concentration of continuous neutralization lye is 20-28 °Bé, the excess alkali accounts for 10% ~ 25% of the theoretical alkali, and the de-soaping temperature is 70 ~ 95 °C. The drum washing water is 20~25L/h, the oil inlet pressure is 0.l~0.3MPa, and the oil back pressure is 0.l~0.15MPa. 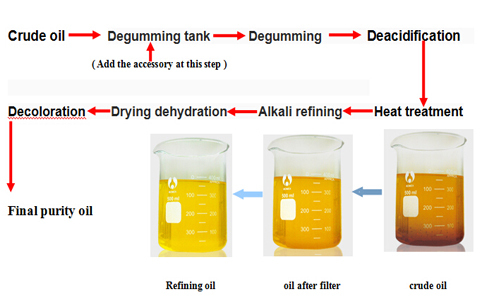 The de-soaping oil washing temperature is 85 to 90 ° C, the washing water addition amount is 10% to 15% of the oil amount, and the residual soap of the washing oil is not more than 50 ppm. The decolorization temperature of solid fat and liquid oil is 105-110 °C, the absolute pressure of operation is 2.5-4.0 kPa, and the time is 15 min. Activated clay added 3% of oil. Distillation deacidification and deodorization temperature 240 ~ 250 °C, operating absolute pressure 0.2 ~ 0.4kPa, time is 80 ~ 100min. The initial temperature of the cooling crystallization temperature is 70-80 ° C, and the temperature is gradually cooled to about 20 ° C for 24 h. The temperature difference between the cooling water and the oil is 5-8 ° C. The filtration pressure during separation shall not be high.